Divination modalities that are used in feng shui. I Ching. Dowsing. Astrology. Tarot. Runes. There are many divination modalities, and in feng shui, some of the most popular divination techniques are I Ching, astrology, dowsing Tarot and so on. Divination (from Latin divinare ‘to foresee, to be inspired by a god’, related to divinus, divine) is a mode of thinking to get insights into a question or situation using different divination methods such as I Ching, astrology, dowsing, tarot, runes, reading leaves or coffee, numerology and so on. I’m wondering if you can pretend you’ve never had precognitive and audacious thinking in your life, and imagine what it is like to go through a typical day. I Ching is a Chinese method of divination and one of the oldest known Chinese philosophy texts and is composed of 64 hexagrams based on the combination of eight trigrams and used in feng shui. Somebody wise, said, “Be happy for all the time you don’t need I Ching.” because if you do, you’re probably at a difficult time in your life. “The Book of Changes is thought to be the oldest of the great Chinese classics and to date from perhaps as early as 1300 BCE. The book may also go back to the earliest phases of human thought because the I Ching is really the ground plan in the way in which not only the Chinese think, it’s almost a mapping of all the thinking processes of man.” The I Ching is the basis for polymath Gottfried Wilhelm Leibniz’s binary code and consequently the basis of our current digital technology. Psychologist Carl Jung used the Book of Changes to examine notions of synchronicity or ‘meaningful coincidence.’ Alan Watts considered the I Ching to be a conceptual model that charted the thinking processes of the human mind. Dowsing is the ancient art of finding or gathering information. The principle behind it is that we can tap into any information field through our bodies and senses. Dowsing rods and pendulums are tools for externalising the intuitive responses that we have about people, situations and things. “People are constantly looking for explanations and striving to understand and make sense of their experiences, thoughts, and actions, as this makes us feel more in charge of our lives.” says Dr Jill Wilkinson, a senior psychologist at the University of Surrey. Whether it is I-ching, tarot or astrology some parts of ourselves want to be assured and want to know that we are going to be all right in the future. ‘Astrology is one of numerous valid worldviews available at the mythic level of consciousness, and it accomplishes a sense of connection to the cosmos, and a role for the self in the vastness of the universe. It is not, however, a rational science with predictive power (which is why it has consistently failed empirical tests devised by astrologers themselves). From the mythic level, we want to preserve the experience of belonging and the capacity for membership in a community. But within any level of reality, there are more valid and less valid views, as determined by the criteria for that level. Astrology is part of the mythic level, and there are good and bad astrologers. Although none of them have thus successfully passed any rational-empirical tests, that is not the actual criteria of the mythic level. The mythic level, like all levels, attempts to provide coherence, meaning, connection to the cosmos, care of others, and pragmatic guidelines. The mythological version of this (of which astrology is a subset) is an interpretive scheme that provides meaning, ethos, mythos, and sanction for the separate self at that level. Mythology and astrology speak to this level in all of us and when in touch with that level, provide a wonderful connection to our vital roots. Good astrologers do this in valid and worthy ways; bad astrologers do not (judged within that level). Of course, it is one thing to tap into that lover level, quite another to remain there (or to champion that lower level as if it were the ultimate level of reality). Those making higher claims for astrology, when they cannot be substantiated, are suspect in any case. Tarot started as a popular, trump-based Renaissance card game in 15-century Italy which is now a very popular tool for examining present in relation to past and future. The common misconception about tarot divination is that it can predict the future. The main function of tarot is to gain clarity, perspective about your life, resolve conflict or troubling issues as well as find patterns and narratives that influence you. Tarot is composed of 78 cards which are organised into 22 cards of Major Arcana which chart and symbolise the stages of your psychological and spiritual growth and 56 cards of Minor Arcana which cover subplots and give further insights. There are also four suits within Minor Arcana: cups represent your creativity and heart/emotions, swords relate to mind/ego, pentacles relate to the worldly needs/aspects such as body, food, accommodation and finances and wands relate to the levels of our energy needed to start new projects. 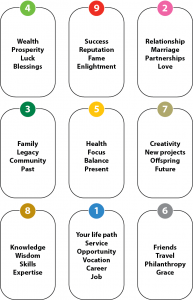 The tarot pack is a simple visual tool that can easily be reconciled with the 9 archetypical energies of the feng shui bagua. Using the tarot in feng shui will help to give you a quick, practical analysis of a situation. 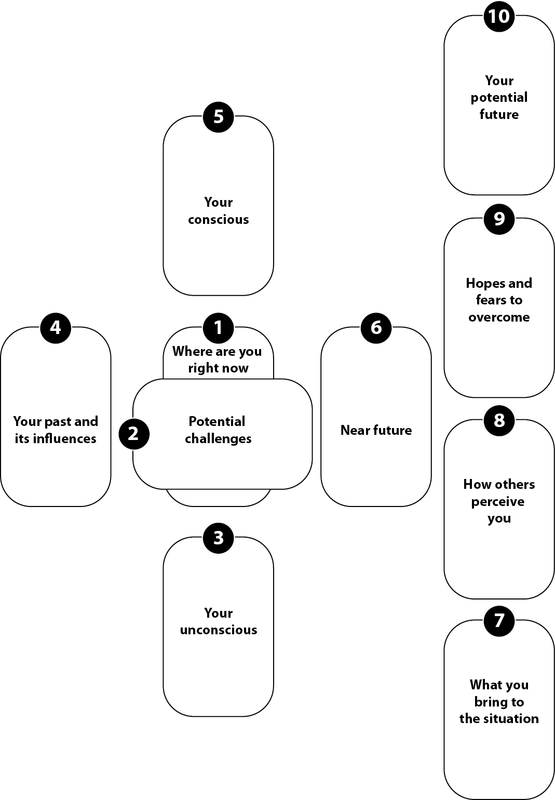 See the bagua tarot spread below. When reading tarot, shuffle the cards with a question in mind. It might be useful to write it down beforehand to gain extra clarity and focus. There are different spreads for different scenarios and needs. Place the cards face down in your chosen spread or particular order. Turn the cards up and start connecting the meanings between them according to the spread matrix. If a card is reversed, ie upside down, it means that the energy of that pattern or archetype is blocked and you need to work on it or you’re coming from fear as opposed to trust, truth and love. Reverse cards, metaphorically speaking suggests that you’re in the process of turning things around as long as you’re conscious about the issue and you’re willing to work on it. Some tarot readers don’t subscribe to reverse card meanings which potentially could be limiting. Celtic cross spread which suggests ways to move forward by looking at the present, past and future aspects. You can use tarot cards to do a bagua type spread for the current year. Ask, “What are opportunities and challenges for the current year that I need to be aware?” If you get a reverse card, it means that the energy of that aspect/house/gua is blocked and needs extra work or attention on an inner level and external, environmental, feng shui level. You can make your own tarot spreads depending on your needs, creativity and preference. 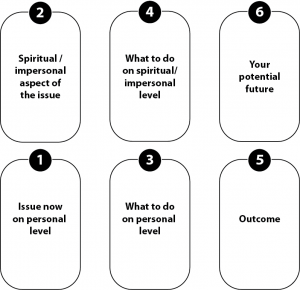 For example, you can make a tarot spread for your chakra system, starting from the root chakra and ending up with your 8th chakra with the intention of getting any insight for what’s going on on these levels. For your feng shui purposes, you can draw a tarot card for each room of your home or workplace. Rune stones (or cards) are used as a divination tool. Rune stones come in a set of 24 ancient alphabetic symbols. Runes were originally an ancient Germanic alphabet, used for writing and then for divination and magic. From about 100BCE to 1600CE runes were used throughout northern Europe, Scandinavia, the British Isles and Iceland. Runic inscriptions have been found as well in North America, which suggests that the Vikings arrived in the Americas long before Columbus.